According to Econsultancy, 45% of global shoppers buy goods from overseas stores. Buyers all over the world are looking for products that aren’t available in their domestic market and products at the right price, regardless of where they are sourced. Thus, think about the masses of world buyers you can reach. International ecommerce is at your fingertips. Don’t wait to tap into this potential. You just need a well-thought-out strategy to maximize your online sales. This section will help you get there. 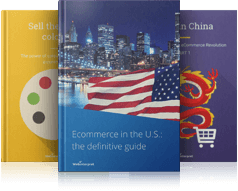 It will help you understand international marketplaces, ecommerce-related processes, will give you insight into online buyers across the globe and much more! Global ecommerce shipping and delivery: this is where it’s going!